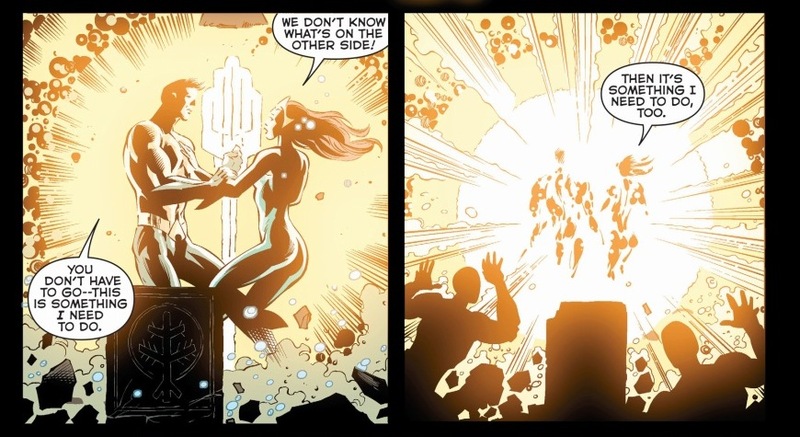 Aquaman now journeys through the Atlantian portal towards an unexpected land. Finding himself and Mera in the surface world of the Apes, Aquaman now uncovers the next shard of truth to his mother’s disappearance. Jeff Parker unfortunately delivers a rather boring issue for this month. 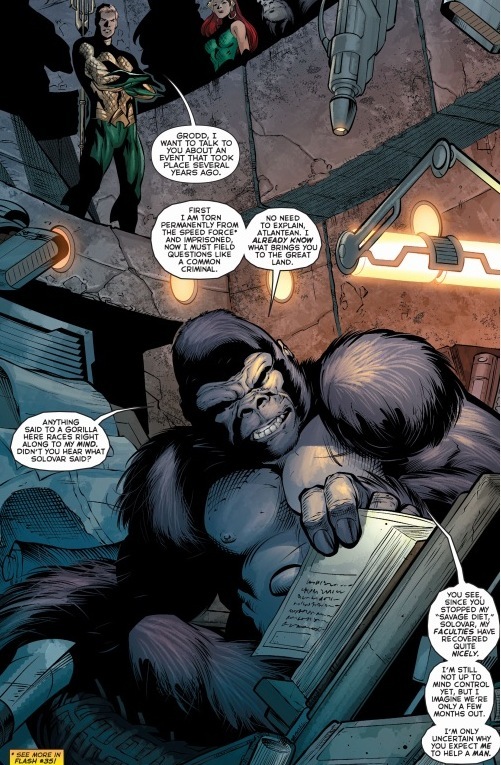 Focused mostly on Grodd and all the apes, the story skews from its attention on Aquaman’s mission to their history. It did not impress me to have the entire story centre on them and I wanted more about Aquamans mother to be explained. If I wanted to read about the apes I would have found their story. It’s clear that the issue works up to the explanation of the Queen being in their land but the two pages of explanation does not outweigh the entire issue feeling likes a fish out of water. Paul Pelletier and Rain Beredo continue the artwork for this issue. It was a mixture of both highly detailed panels and some underdeveloped lines. 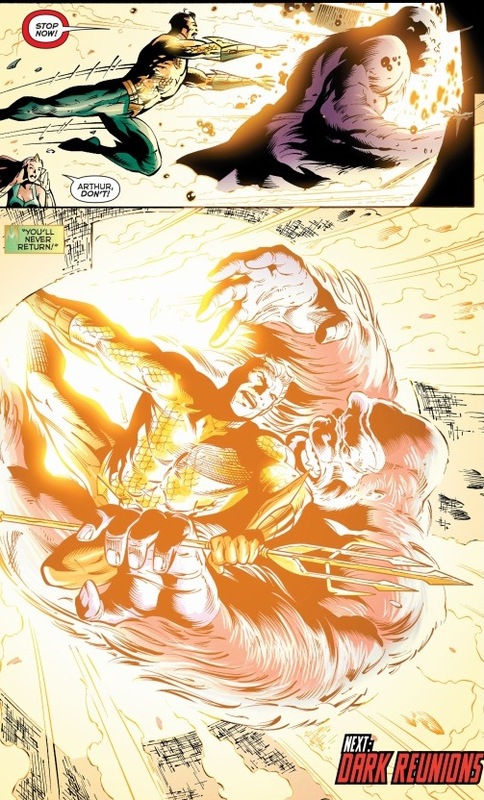 As the issue goes along, there are some stunning pages such as the close up of Aquaman and the apes faces but as movement comes into play, the panels become weak and choppy in both coloring and execution. I also found this was the case for the splash pages too losing a lot of focus for heavy shading. Oh Mera has done it again. 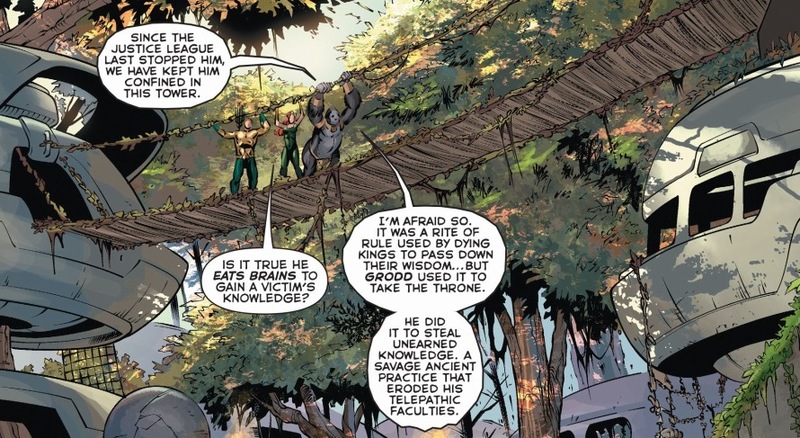 I’m glad that Parker decided to take the Queen along for the ride in this issue as her bold insights to the ape culture come off really hilarious. She’s the ice breaker for the issue and as always she is just stunningly drawn. It’s no wonder Aquaman keeps her around with her wit and a body like that. I also like the fact that the water based characters have a certain sheen to them always making them look perpetually wet. Whether its intentional or not it helps keep reminding readers that they belong to the sea. This issue is not about Aquaman so anyone hoping to read about the Sea King, you will be disappointed. The whole issue was slow and took too long to get to the short point. I felt that they could have added a lot more about the Queen and her travels within the new world or perhaps how she used them. This was just about the ape history and felt so stagnant to the entire plot. I also didn’t like the references to volumes at least 10 issues back. Pointing back to older Aquaman issues and other character series makes the story line really hard to follow or ever remember and honestly, if it takes you this many issues to get the point across, its long gone by now. Remaining on his quest for truth this month’s Aquaman leaves readers with only more questions to the plot. 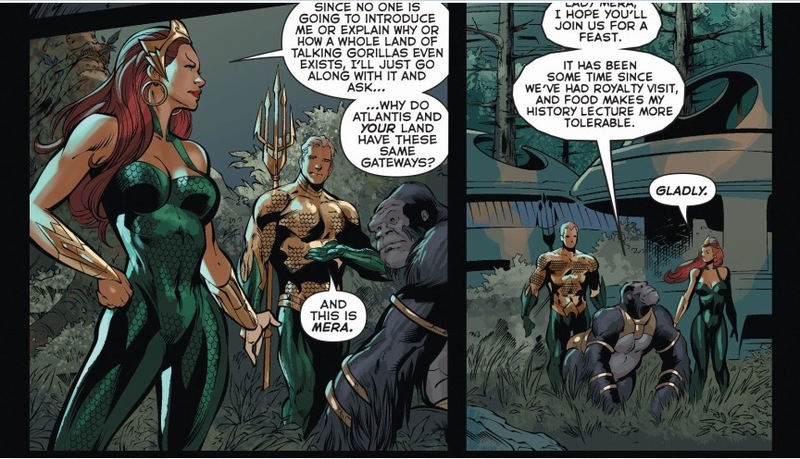 With the apes filling out another piece to the puzzle, will Aquaman find his way back to the land or will he end up in somewhere unexpected…. Perhaps space?